While the people of Alice Springs were demanding to know why they were without light, airconditioning and fridges for 10 hours on a sweltering day last week, Chief Minister Adam Giles was suppressing information linked to the blackout across town, clearly so that he could get his photo (pictured) on the front page of the Murdoch-owned Centralian Advocate. 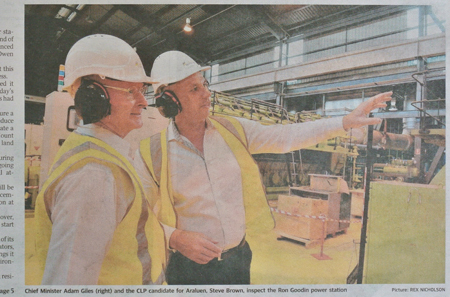 And CLP candidate for Araluen Steve Brown was obviously a willing participant in the ruse. As it turned out, the Alice Springs News Online trumped on Tuesday much of what yesterday’s Advocate labelled as an “exclusive”: We published the fact that a 44MW generation plant at the Owen Springs complex was on the drawing board, with capacity to replace the Ron Goodin plant, at the end of its life here in town, and that the tender document was dated August 4 last year. Those details came from an unnamed source whom we trusted to be reliable and who turned out to be very well informed. We also pointed to our reports, over years, about the impending end of life of the engines at the Ron Goodin plant and their deleterious impact on the nearby residents. Meanwhile Territory Generation, no doubt on instructions from Mr Giles, and the government itself, were playing dumb. Territory Generation is “a government owned corporation” with a media division, but clearly Mr Giles can snap his fingers and the company will pass information to an overseas-owned medium a day ahead of the other media informing the town. The Advocate does not have a printing press. The paper is printed in Darwin and flown here. Its deadlines are way behind those of the burgeoning online media, including the Alice Springs News Online. Mr Giles and Mr Brown were having their photo taken, presumably on Thursday, in the engine room of the Ron Goodin station, which is under the control of Mr Duigan. That is obviously when the details of the story were given to the Advocate. It is American owned and controlled – so much for the tirelessly professed preference for local businesses by Mr Giles. Had local media been treated equally by Mr Giles, and had received the material at the same time, the public would have been informed at least a day earlier. But the non-Murdoch media got the information from Mr Giles yesterday morning, after the Advocate had begun to hit the streets. RELATED REPORT: The Electrical Trades Union has called for a transparent investigation into recent Alice Springs power outages and to fully investigate the CLP’s role in the service issues. As someone who reads the Advocate on occasion, I am disgusted that the editor recently reported about the gas generator technology associated with this $75m project – without mentioning the fact that it has been chosen because it can take gas from fracking. It is mentioned clearly in Clarke Energy’s media release, but the Advocate, clearly reporting from the same media release, saw fit to omit any reference to the new generator’s specific design suitability for fractured gas. $75m NT Taxpayer dollars SHOULD NOT be spent propping up an industry that is flailing across the nation. Andrew Taylor, you’re being a bit moronic. WordPress is free and open source, anybody can start a website using it without contributing money to the company. I’d love to see you try to start a website without buying hosting from somebody. By your logic, even if you host it on your own servers, well, you’re just owned by IBM or by Intel or AMD or what hardware you use. In short, I think you really, really, have no idea what you are talking about. What a ridiculous smear. 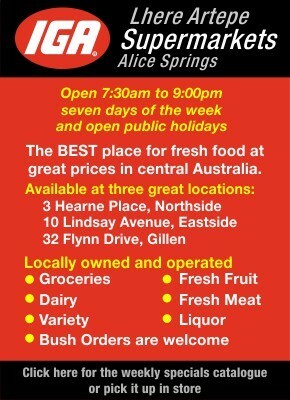 I thank Erwin for an alternative to Murdoch’s rags every day I check alicespringsnews.com.au, and I’m in Darwin! If you don’t like it here, leave, will you Andrew? @ Andrew Taylor: Here are some points, made at the risk of you lambasting me for “tempering” with the freedom of speech, which we are affording you, and the writers of the 10,692 comments since August 2011, contributing much to the substance of our online newspaper. We call this debate and we’re facilitating the biggest one in town. You might like to add Facebook, Twitter and many other providers of online services, used probably by you and certainly by most of our readers, to your list, and comment on their ownership. Of course the point of that would be hard to see. How the use of those services makes us foreign owned, as the Advocate undisputedly is, is something you need to explain. By your logic all Australian Facebook users are foreigners. 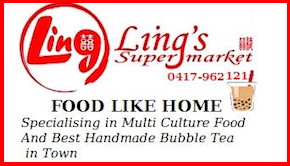 Why don’t you tell the NT Government to drop its buy local campaign? You describe the Alice Springs News Online as a blog. Do you regard the online editions of the Sydney Morning Herald, the London Times, Der Spiegel, the Washington Post, Le Monde and a few thousand other newspapers as blogs because they appear online? We produced a printed weekly newspaper for 17 years. The conversion to online has changed the wrapper, not the content. You are suggesting the Press Council, toothless as it is, has the power to licence newspapers. It doesn’t. Anyone can start a newspaper – why don’t you try it and see what readership you get? I joined the Australian Journalists Association, which later became the Media Alliance, in 1969. I consider its Code of Ethics as binding and have always acted accordingly. Judge how well it is observed elsewhere in this town. Soapbox? Do you really think it is proper for you make, in public, an unsubstantiated, denigrating remark about someone else’s work? Otherwise we publish news. News reports make up the overwhelming proportion of our content. We have a seven million word story archive spanning nearly two decades, overwhelmingly with independently researched reports rather than handouts that are the staple elsewhere. This online archive is a much used resource about Central Australia. Let’s sit down over a coffee or a beer and you tell me which of our reports are deficient, because they are not in the public interest; because they contain errors resulting from sloppy research; because they fail to give right of reply; because they omit relevant known facts; because they lack objectivity; because they are badly written, because they are motivated by commercial advantage (such as advertising masquerading as journalism). If we have a personal interest in a subject (such as several of the planning stories recently), we declare it. Unlike most journalists we almost always show story drafts to our sources ahead of posting so they can point out errors and omissions. That works very well for us: We get it right almost all the time (and when we don’t we publish a correction), and it instills confidence in our sources which makes them inclined to provide more information for our readers. I’m glad that the news media – national and international – which have bought my journalistic services and products over the past 50 years, didn’t take your view of the gifts I have. I began to learn my craft as a court rounds reporter for a daily paper in Vienna; within a year of migrating to Australia, I was editor of the West Coast Sentinel; I worked for years for the Centralian Advocate, including a decade as Chief Reporter; freelanced for dozens of print media; produced thousands of news reports and documentaries (camera and text) for all Australian and a string of overseas television networks; risked my life in the war zones of Biafra, Cambodia and behind Soviet lines in Afghanistan; shot freefall footage – in short I’ve done many of the things that make journalism the best job in the world. And one of the most important. I regard the founding of the Alice Springs News 23 years ago now as one of my most important achievements. You ask about other ‘bloggers’ on this site. Senior writer Kieran Finnane has been with us from the start. Her reputation as a journalist and arts writer sees her contributing regularly to national journals and she has just completed a book of long-form journalism, drawing on her reporting for us from the courts, which will be published by University of Queensland Press in June this year. Any more questions? As for our many valued guest contributors from the community, their copy is clearly presented as such and is handled editorially the way comment pieces in any serious print media publication are. 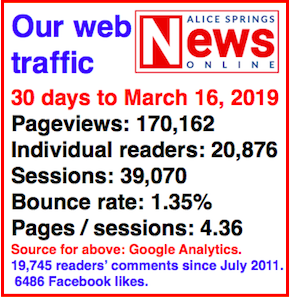 Keep logging on to the Alice Springs News Online, Andrew, as I’m sure you will, because you’re in good company: Up to 22,000 people making up to 190,000 page views a month. This is how our readers determine our worth as a news medium and mine as a journalist. @ Janet. Let’s not turn this into the Steve and Janet Brown show where readers have to spend their time guessing or querying what policy differences you have between you and your husband. Of course it is OK for you to have different opinions but as prominent identities in local politics it would be good to know what your position is on this $75m dollar spend. Will you use your voices to lobby the Chief Minister to put some cash into solar – or not? It is a bit rich to complain about the Advocate being owned by an American company without further analysing this blog’s structure. This website uses WordPress for its content management system. WordPress is owned by Automattic, a private company based out of San Francisco and valued at US$1.16b. This website is hosted by iiNet, wholly owned by TPG Telecom Limited. TPG is based in Australia and was begun by a Malaysian-born businessman. In 2014, TPG had nearly AUD$1000m in revenue. It has shareholders the world over. So to dismiss the Advocate as “American-owned” while ignoring the admittedly small amount of money spent by this website on international corporations to publish smacks of hypocrisy. Further, the Advocate is a member of the Press Council of Australia. This website, as is the case with most blogs, is not recognised as being a member of the press. Similarly, journalists at the Advocate are often members of the Media, Entertainment and Arts Alliance – Australia’s professional body representing journalists. Are any bloggers on this website members of the MEAA? @ Graeme Sumner – electronic soapbox is a brilliant description of this website. The “editor” regularly professes to allow free speech in the form of comments. But I note that criticisms of this website rarely pass without a response, tempering that supposed free speech. Nevertheless, I look forward to a response from this supposed beacon of Alice Springs’ values. @ Solar Investor: We are living in a free world were I am entitled my opinion and also to be free to be acknowledged for my own opinions. I am not my husband’s keeper nor is he mine. We agree to disagree a lot of the time on issues and some we agree fully on. I have always expressed my right to opinions and I would appreciate it everyone out there excepted that also. Is it the dark ages keep creeping back in, with a lot of people who either believe that only Steve has the right to opinions or they attack him for mine? Reminder to Labor voters: I am an individual and I have strong opinions that are mine. @ Graeme: When the Code of Ethics used to be something every first year cubby journo could recite by rote, there used to be a conviction that when there was no effective Opposition to a government, that was the media’s job. Pick up any copy of the Territory’s American-owned daily and show me a single story where its fearless journalists have deigned to ask a question of a Government Minister (unless somebody is spilling some dirt on someone else because there may be another leadership coup being plotted). Read the Budget papers and see how much NTG spills into Rupert’s pockets and you may understand why. I personally don’t believe it is Erwin’s job to chase ambulances (yet he seems to have crime stories well before the American mob) but what he is providing is a forum where people can share ideas and opinions and in my mind, Alice Online is doing it better than most. This year, perhaps more than at any time in the Territory’s past, we need a forum like this website. Let’s face it, we have a Government that opinion polls suggest many people have stopped listening to, an Opposition that does not appear to have changed its nappy since 2012, a lunatic fringe breakaway party that may or may not be a set-up by one of the major parties and a weird and wonderful gaggle of wacky independents emerging from the woodwork (I don’t include you in that number, Phil). You don’t have to agree with everything that has been said and in fact, if you don’t Erwin will still publish your comment providing you aren’t being rude or defamatory. When government attempts to control the media, ultimately anarchy can be the only winner. Isn’t it funny how those who have the cash, the spin doctors and access to power get in a tiz when someone dares to highlight what’s really going on! 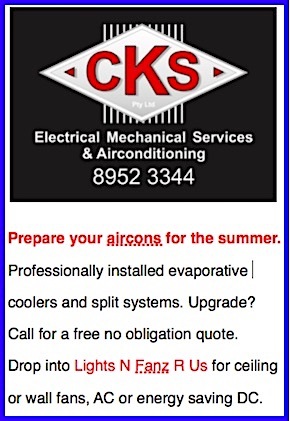 How many staff could you have employed with the money that the CLP government spent on advertising in the Advocate? @ Graeme Sumner: For me it’s news when a politician withholds information from the public until he can make a good fellow of himself on the back of spending taxpayer’s money. I note you don’t think so. It’s a free country. @ Janet and @ Steve: Out of interest what is the issue with the visual effect of solar arrays? Every power generation type has impacts, noise, visual, waste, and more. On one hand you want to be seen to be supporters of solar. On the other hand you complain about visual effects of solar? If you really do support solar now is the time to make your voices heard! $75m is a lot of money to spend. Please tell voters why it is not reasonable for us to ask why you have put all our money into gas technology investment when putting some into solar makes so much sense?! Not everything is a green conspiracy! There are many different types of people who live in this town! This is just voters asking questions! Pretty self-indulgent stuff from Alice News. Stick to reporting the news. For all your repetitive, tiresome ranting about the Advocate and the Murdochs, there is a reason why Giles would want to be on the front page – people in this town actually read the paper. Worse still, and perhaps the real reason for Erwin’s bile, is folk actually pay the Centralian Advocate good money to do so too. As for being local, I’d reckon the printed rag employs more people and contributes more to the local economy than your electronic soapbox. Keyboard warriors are so brave hiding behind pseudonyms. A few history points for you all. Murray Stewart, Steve Brown and me, with the assistance of David Nixon, local film maker, whom we paid for his services out of our pockets, made a DVD to send to Canberra to promote the best reasons why Alice Springs should be a solar city. Whilst most government levels asked for that spot we were proactive to get the best results. A DVD to our knowledge was the only DVD sent in to support application for the privilege of being a solar city winner. And we won. I made comment re what I viewed as visual pollution of the solar panels at the airport. I was extremely complementary to the airport for putting solar panels over the car parking. We are all embracing new technology to provide our power. What we also have to do is ensure that we are not caught up in believing that environmental concerns do not belong to the Greens alone. We all want to protect our planet. Balance is a good word for you all to learn. Who cares. They’re both gone by the next election. ZERO his brain is frazzled from watching 12 TVs at once. Remember that’s one of the reasons solar is no good for him cos he has 12 TVs. In a changing world innovation is survival. Catch up, Steve. @ Power: I am as enthusiastic about renewable energy sources such as solar as any of you! 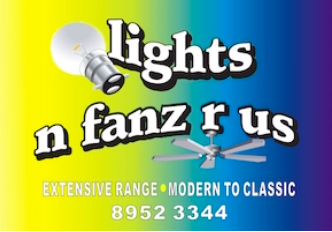 You heard the hue and cry over a few hours of power loss – imagine if it went down for weeks! In 1974-75 Alice was cloudy and raining most days. Solar would have left us in the dark for most days and every night! The facts are that as of yet the technology isn’t there! Yes, I know its coming, but responsible governments can’t wait around for possible outcomes. That being said there is good news for solar in this story. The new gas generation equipment is replacement of existing capacity in a new location. Actual growth in the market place “is being catered for by solar” as is more and more of the daily energy requirement. Here’s the but: We also have to maintain enough generation capacity to cover cloudy days or weeks! Further, solar is also subject to sudden fluctuations, a cloud moving across even on a fairly clear day can produce a sudden drop in KW produced, placing immediate demand on the gas operated generation: The greater the level of reliance on solar the greater the effect will be. Clearly this will be resolved to a large degree when affordable reliable battery technology arrives. Clearly this is also happening with the likes of the Tesla Wall but we are not there yet! All this adds up to the fact that we are in a time of transition in technologies, many unknowns, many uncertainties alongside one absolute certainty, that is our community demands a continuous, totally reliable, source of power. Government has to base its decision “in the moment” and on that demand. A bit of good news about the blips in our power supply: I believe there is to be included in this power station upgrade some synchronous flywheel technology which will help to take out some of the demand shocks to the system, making faults such as that that led to the last blackout less likely. @ Steve Brown: I think you have missed something. Who in the end is going to be paying for this generator? Oh, that’s right, the tax payer of Australia. What are the new Rolls Royce engines doing at Owens Springs, what are they generating? $40m was spent there recently. Would it not be cheaper to bring in lines from SA? I think this announcement should have been made on the 1st April. This money could be better spent elsewhere, such as creating industry and work and jobs. I believe we have enough sun for solar power which would be far more cost effective. @ Dave: I work out of town for part of the year, but I do remember power outages as being the same or longer over the past 30 plus years. I also recall that the generator needed replacing a number of years ago, not recently. Labor didn’t do it – Giles is. Just said it. Over and out. The new power station runs exclusively on gas whereas the old one was gas and diesel, so more gas will need to be bought from Central Petroleum. Central Petroleum underpins the Territory’s fracking future and will feed the NEGI gas pipeline. The new power station is aimed at assisting the fracking oil and gas industry in the NT. @ Sean: Giles and the CLP deservedly feeling the heat on this issue! The simple fact remains that these end-of-life issues were identified years ago. He talks about infrastructure but what has the CLP ever done for us here in Alice? Maybe if he wasn’t so focussed on fracking infrastructure we’d have been given some attention. Seriously though. The specific question is: What has Power and Water been doing? Well, they’ve probably been too focussed on the split up of Power and Water and the separation of duties rather than doing the job: planning for and providing stable power for Central Australia. Sean, perhaps you don’t live in Alice Springs? Yes this recent whole-of-town half day outage was bigger than usual, but it feels like we’ve had 15 to 20 minute outages every second weekend in Braitling! Something bloody needs fixing! I’m pleased they’re putting in new infrastructure, but I’ll be putting in a new government when I get a chance to vote! Some good points are made in this report, although I am a little tired of Adam bashing. But let’s keep some perspective – power failures have occurred over the past decades, not just recently. We all know the present power generator has reached the end of its life and so it is being replaced. What more can be done? The Centralian Advocate does print out of date stories, but that is not their fault. Blame the fact that the printing has been moved from the Alice to Darwin. If the Alice Springs News has had a “reliable” source for such a long time, shouldn’t this person be investigated for disclosing privileged information? Then again, when and if the CLP is replaced by Labor, then Alice Springs may have to miss out on such information. Looks like a no-win situation to me. Just saying. My system cost $8500 installed and produces roughly twice as much as I use. As I understand it, the new power station at Brewer Road supplies about half the generation we need. Why not support more rooftop panels and batteries for less than $75m? We could cover the town and wouldn’t need any more gas generators. Especially if we get Tesla on board. Giles and Brown wouldn’t just make it into the Advocate then but it would be national news, perhaps international, great for their egos and good for our town. $75m would go along way towards a sustainable future. Not impressed by the CLP’s lack of vision. Yes, we need to make an upgrade – but $75m into old gas technology?! For that much money Alice Springs could probably take 5000 houses off the grid using new solar storage technology. Imagine what it would do for Alice Springs and our reputation as a leader in the solar industry! It would totally renew and energise our town. Sure, we need do do some upgrades to provide backup generation certainty in the short-term, but the very least the CLP (or Labor) should compromise and replace the essential generators (their replacement has been long overdue!) … and put the rest in solar storage technologies. Back of the envelope calculations say that $20m into gas energy generation and $55m into solar storage ought to do it. The good thing about running a high level NTG off-grid solar storage subsidy program is that private individuals will be happy to chip in a portion of their own cash – thus creating a massive multiplier effect for government (tax payer) dollars spent. Imagine if Alice Springs could do something ground breaking and get Tesla’s attention with this? Apparently they are looking for towns who are ready to talk business. This fantastic announcement for the Alice, fully funded and already contracted, deserved some fanfare don’t you think? A $75m investment in our community’s future is fantastic news for the Alice! However, there always has to be an actual moment when all the ducks are lined up that an announcement is made. I am absolutely certain the Alice Springs News will share in its community’s joy at the announcement, while justifiably taking credit for some of the lobbying effort that led to it.